No surgical procedure can claim to be completely painless. But it must be said that pain is not an important factor at all in hair transplant. Although patients are very worried about pain before the procedure, they will find that the pain during and after the procedure was not at all difficult to get through and all their worry was misguided. Hair transplant is done under Local Anesthesia. This means that the patient remains conscious during the procedure and pain is controlled with local anesthetic injections only. Prior to starting the procedure, both before graft taking and before planting, multiple injections of the local anesthetic have to be given in the area. In DHTC (Downtown Hair Transplant Center), the injections are given with a microscopic needle which makes the pain during the injections easily bearable, though a slight bite like a mosquito prick, is felt. Once the injections have been given, the area is anesthesized and the patient feels no more pain for the rest of the procedure. The earlier strip method has much more pain postoperatively. 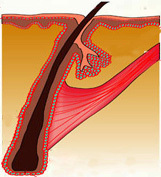 This is because a strip of skin is removed leaving a scar and there is also a long stitch across the scalp. This causes a lot of pain. There is also pain during sleeping at night when the patient sleeps on his back and the patient will find his sleep broken with pain for several days. In fact pain when sleeping on the back of the head can last for months till the wound heals completely. Sometimes nerves are cut during removal of the strip and this can cause neuropathic pain which can last for years. All these factors for pain are not present in the FUE method. Overall, pain is not an important factor in this procedure.